I've been thinking about Square Foot Gardening again and even bought the Kindle edition of All New Square Foot Gardening, Second Edition: The Revolutionary Way to Grow More In Less Space and I might actually build the garden beds this fall. Over the years I've been working on the best Square Foot Garden design for me. I wanted my boxes to be somewhat attractive, easy to maintain and versatile. 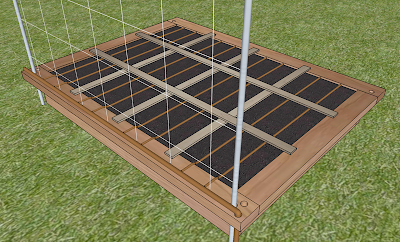 Additions such as trellises for vines (tomatoes, beans, squash, melons, etc.) and hoops to extend the growing season should be easy to add as should drip irrigation. This is the design I came up with which I'm hoping to build this fall. In this post I'll discuss the main features of this design. For detailed instructions to build your own see my post on how to build a raised garden bed. Some of my boxes will be simple but my main boxes will have this nicer design. My boxes will be 3' x 4' because they fit better in my space than the 4' x 4' Mel Bartholomew recommends. You can change the dimensions to suit your needs. 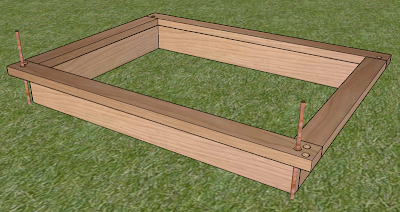 I'm planning to build my boxes out of 5/4 x 6 Cedar decking and 2 x 4 cedar boards. The 5/4 decking is thicker than 1x boards, a little thinner than 2x but much easier to find. 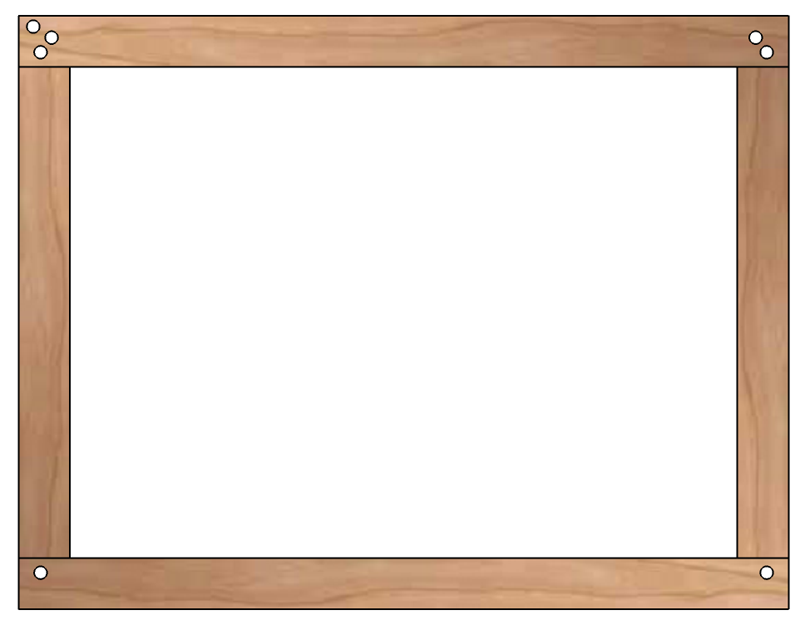 These boards will comprise the bottom of the box. The 2x4 boards will create the lipped top. The 2x4's are a little wider than I wanted. 2x3's would have been better but I couldn't find them in stock nearby and I don't have a table saw to rip them down. The 2x4 lip around the top of the box started out as being primarily for aesthetic reasons but it does serve a few useful purposes. First it adds and additional 1-1/2" to the depth of the box so the total depth will be 7" as opposed to the 5-1/2" if just using the 5/4x6 boards. 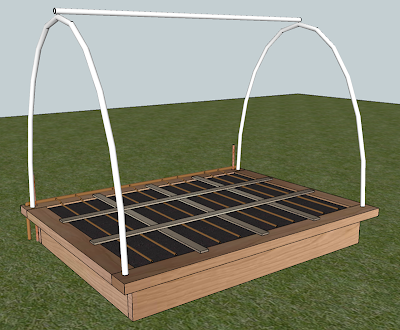 It also provides a nice surface to lean against as well as allowing space for attaching features such as trellises, stakes, covers and other raised garden bed accessories. 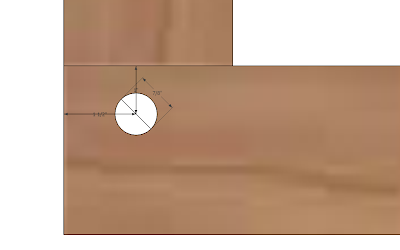 The outside dimensions of the lower portion of my box will be 4' x 3' and I'll need two 36" and two 45-1/2" lengths of 5/4x6 for the base and two 33-1/2" and two 52-1/2" lengths of 2x4 for the top. Each box requires 2 5/4x6 and 2 2x4 boards. I'll be connecting them using Kreg 1-1/4" SML-C125B-100 Blue-Kote WR Pocket Screws which are weather resistant. All pocket holes will be made on the outside so they're not in direct contact with the soil and protected from rain by the lipped top. The holes can then be covered with Kreg Cedar Plugs for additional protection and a more pleasing box. Every once in a while I come across an article that PVC can leach chemicals into water and soil, other sources say differently. Either way I thought it would be better to provide holes for accessories so that they didn't need to be inserted in the soil. That way there's less of a chance of disturbing the roots of growing plants too. There are 6 main holes, 2 in the front top piece for accessories such as the hoops, and 4 in the back top piece, two for hoops, two for the trellis. There's also another hole to allow a 1/2" main drip line which will be discussed later. You can put this whole wherever works best for you. On each end of the bed drill a 7/8" hole all the way through the 2x4 with it's center 1-1/2" from the outside edge and 1" from the inside edge as shown. On the back, drill 2 holes on each side. All holes will be 7/8" in diameter. The accessory holes centers are at 1-1/2" from the outside and 1" from the inside. 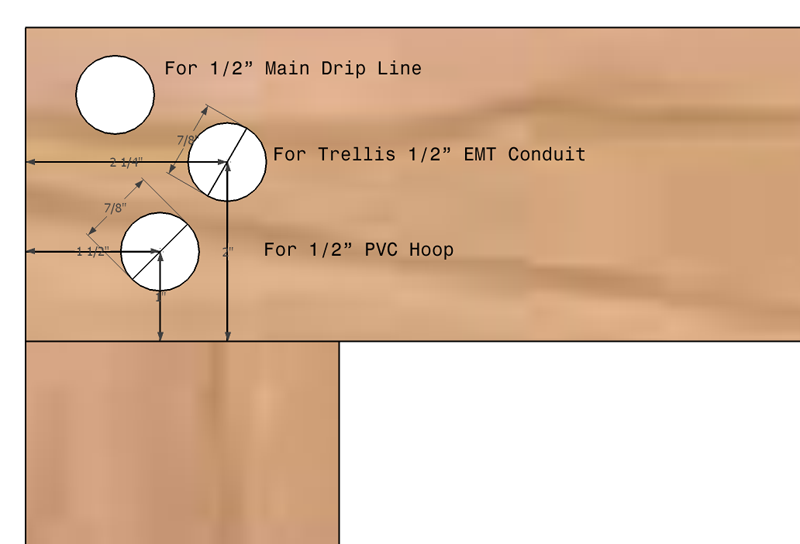 The trellis support hole centers are 2-1/4" from the outside and 2" from the inside as shown. Determine where you want your box located. If you're making multiple boxes lay them all out and make sure you're happy with the arrangement. You should have plenty of room between the boxes to walk and tend your beds. Three feet is the recommended distance. 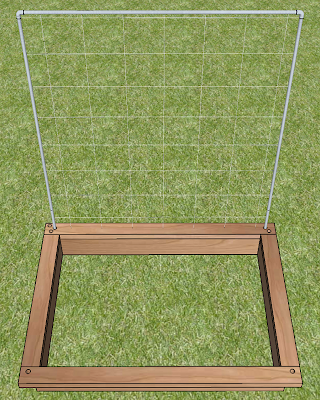 If you're going to be using trellises for vertical gardening make sure the side with the 4 holes is facing either North or South so the taller plants on the trellis do not block the sun from the other plants. With the boxes where you want them use a hammer to drive 18" or 24" lengths of 1/2" rebar through the trellis holes, into the soil until you have about half the rebar in the soil. The rebar will provide support for the trellis. Cut a 10' length of 1/2" EMT conduit (metal not plastic) in half using a hacksaw so you have two 5' lengths. Attach a 90 degree conduit elbow to the top of each. Now place them over the rebar and through the hole so that the bottom rests on the ground. Measure and cut the top support to fit into the top elbows and screw down the set screws in the fittings. 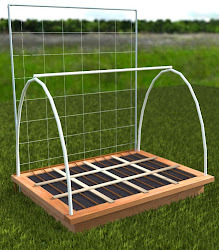 Tie Dalen Gardeneer 5-Foot x 30-Foot Trellis Netting TP-30C to the trellis supports so that it is nice and tight to provide good support for your plants. This is a heavy duty nylon netting that can support your heavy vining crops. When you aren't using your trellis you can pull it off and store it. Leave the rebar in place. One of the most important components of Square Foot Gardening is the right growing mix. It is recommended to use a mixture of 1/3 Peat Moss, 1/3 Course Vermiculite and 1/3 Compost from different sources. Fill your raised garden bed to the top with this mixture. Now the distinctive Square Foot Grid can be screwed onto the planter. I went through many incarnations of design of the drip system for my Square Foot Garden beds. Some were complex that included a number of manifolds but that was too expensive and would be a pain to maintain. Keeping the irrigation simple seems like the best solution. It starts by T-ing off the 1/2" main drip line that runs behind the box and running 1/2" drip line over the top of the side of the box and passing it through a 3/4" or 7/8" hole drilled into the top. A 1/2" barbed shut off valve like the Drip Irrigation 1/2" Perma-Loc Hose Coupling Valve can be used to turn off water to that box when not being used. You can place the 1/2" drip line along any end of the box that makes the most sense for you. You'll need to close off the loose end to seal it off. You can drill 2 small holes in the top, fold over the pipe using a figure 8 end closure fitting and zip tie it in place. If you want you can also use an 8 port manifold on the end in case you need more flexibility in watering but using the drip line suggested below should be all you need. If you do need to add some more drip lines you can always just punch into the 1/2" main line. Next install 1/4" drip line with emitters off the 1/2" line using 1/4" barbed fittings so that there are 2 lines running each square foot. The best drip line to use for Square Foot Gardening is Toro 53640 Blue Stripe Drip 1/4-Inch Tubing Sprinkler with Emitters because it has emitters every 6". Each emitter delivers 1/2 gallon per hour. Space the emitters properly so they will be in the planting area of each square foot. This results in 4 emitters per square foot which will deliver 2 gallons per hour to each square. The water will go directly into the soil which will help prevent issues with disease that can occur when the plant leaves get wet. Close off the ends of the 1/4" tubing using appropriate end caps. Adding a cover over your vegetable garden gives you a lot of flexibility. 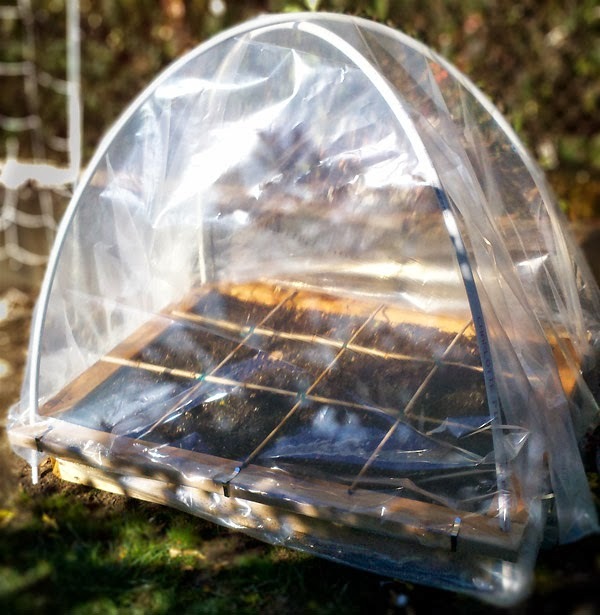 It can help you regulate temperature by using a 6mil poly sheeting to trap in heat in the cold months or use a shade cloth in the summer and you can even use netting to keep birds and other animals out of your garden beds. The covered wagon design is the most visually appealing to me. You'll need 3 10' lengths of 1/2" PVC pipe to construct it. 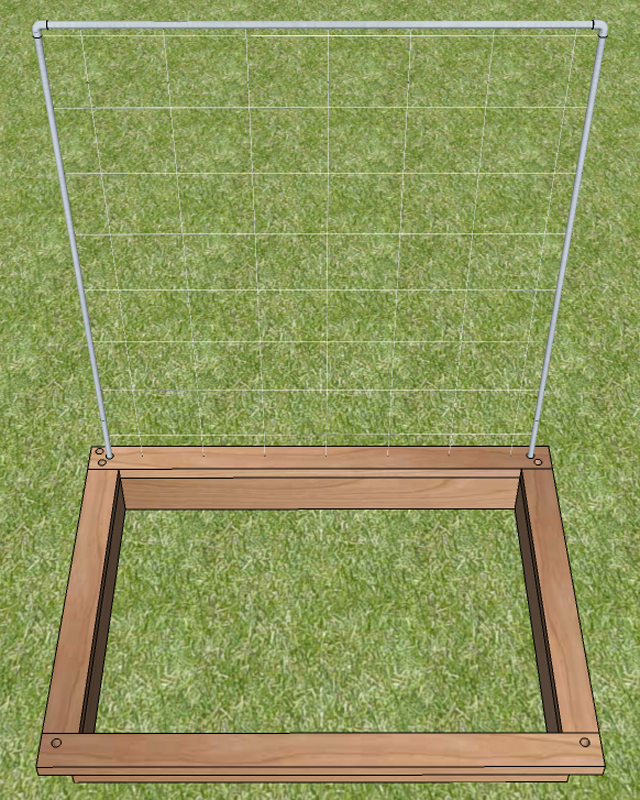 First determine how high you want your mini-hoop house to be by experimenting bending the pipe. When you find your desired height, cut 2 of the PVC pipes to length. Next, drill a 1/4" hole in the center of those 2 pipes and insert the ends into the accessory holes in the top lip of the bed. Measure and cut the 3rd piece of PVC pipe so it spans the two hoops. Drill 1/4" holes on each end and attach it to each hoop using 1/4" nuts, bolts and washers. Cover with whichever material is appropriate. You can use spring clamps to secure the bottom of the cover to the 2x4 lip. When you're not using the covered wagon it is easy to remove and store. 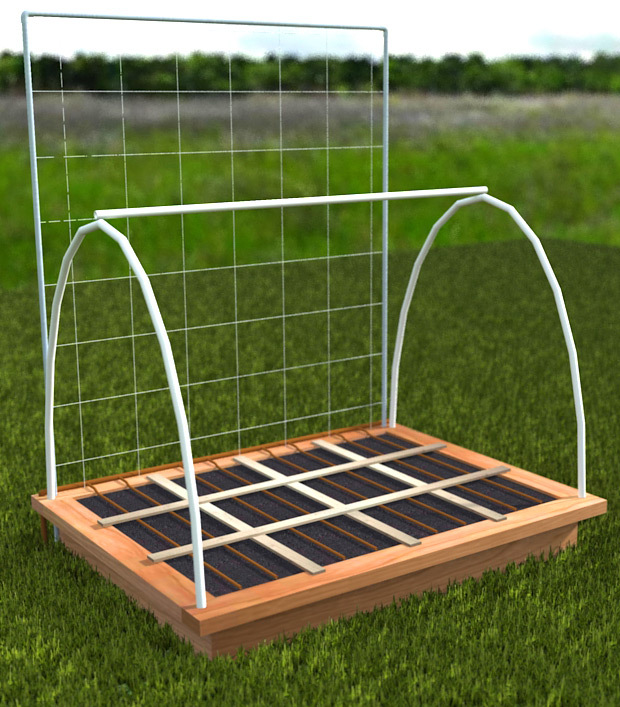 You can even use the accessory holes to for other items such as cages or even solar path lights. Hope you found this helpful. 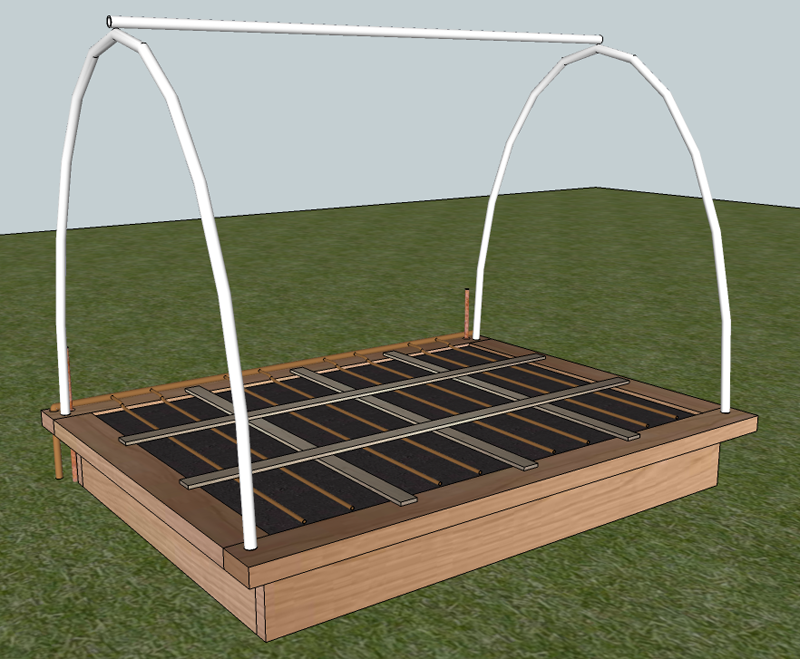 Here's another look at the Square Foot Garden bed with drip irrigation, trellis and hoop house.